You have probably heard that some diffusers are ultrasonic, but what does that mean? It means that this type of diffuser has a small vibrating disc at the bottom of the water reservoir and it moves very quickly, using electrical frequencies. When the disc moves in this way it creates a cool, odorless, water vapor that is suspended in the air. Have you ever stood by a waterfall and noticed a light mist? It is the action of the waterfall that creates the mist you see. Ultrasonic diffusers work in the same way. Pretty amazing! Our bodies have a magnetic field. This field is made of negative and positive ions. In our modern world we are exposed to an overabundance of positive ions (also called “free radicals”). Free radicals have unpaired electrons. They are highly reactive and they take electrons from our healthy cells to neutralize their own charge. This can cause cellular damage to our bodies. Cell phones, computers, televisions, electrical equipment, some foods and pollution produce these nasty little “free radicals”. What are we to do? How can we counteract these positive ions with negative ions? If you are lucky enough to live by an ocean, a waterfall or even in the mountains then you have access to an abundance of negative ions in nature. Most of us are not fortunate enough to live in such an environment though. There is something we can do. This is good news. We can use an Ultrasonic Diffuser! Negative ions are produced in the diffuser when the small ceramic disc vibrates the water and creates the vapor that we breathe in. Awesome! If you choose to add essential oils to your diffuser, the ultrasonic vibrations will break the oils into tiny micro particles and disperse them in the mist as well. 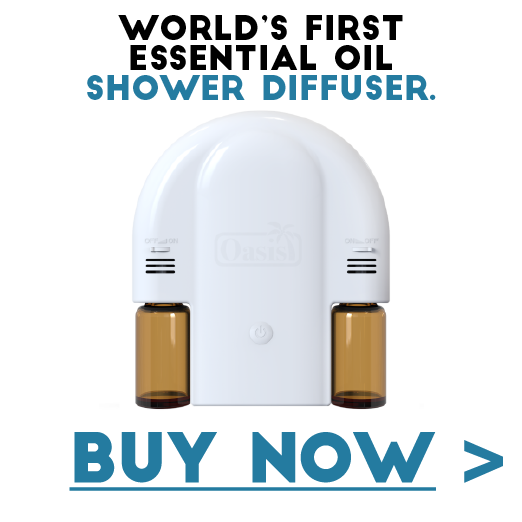 Simply add water to the fill line, add essential oils if desired, replace the covers and turn on…very easy! Oh yes, if you want a little ambience then just turn on the light. To be completely honest, my diffuser did stop working twice over the past two years. All I had to do was add water and 10 drops of vinegar into the reservoir and let it run for 3-5 mins to clean it. I suppose, if I was more prudent about taking care of it, this would not have happened. However, once I cleaned it, it performed just like new! I fall asleep with it running, knowing that it will turn off when it is finished. I would never go to sleep with a candle diffuser burning. So this is an awesome thing! It hardly makes a sound either, once in a while I hear a little gurgle of sound but it is not disturbing at all. I quite like the design too, it is heavy enough not to tip over, which is great as I have a cat, and you know cats! Some people say that these units are expensive. I really do not agree. I have been using my Saje AromaOm Diffuser for over two years. I believe, I would have spent more money in that same time frame, if I was replacing the cheaper diffusers every few months. If you are considering getting a diffuser, then I would highly recommend the AromaOm Ultrasonic Diffuser. Very nice looking site, another Amazon seller, seems Amazon is very popular for those that live in USA. Really good information you have done your homework. Essential oils seem to be very popular also. I like the fact that you have included as much as possible on your site in a short time. Keep up the good work. I appreciate that you stopped by and took a look around the website. I think essential oil use is on the rise, it’s great to see. I truly believe in their benefits! Thanks for commenting and have a great day! Angela this field of aromatherapy is new to me but intriguing as well. I think of it as an alternative medicine to prescriptions. The experiences one feels by the effects of the aromas for whatever reasons I think will result in a positive change. I think the field of essential oils is gradually becoming more and more known. The benefits of aromatherapy are quite effective and certainly provide us with an alternative to prescriptions in some cases. Thanks for stopping in and leaving a comment. Do you like it? How is it working for you? Mine has been great! Let me know what you think of it. Thanks for commenting. I look forward to hearing from you again, Amanda. Previous PostPrevious Essential Oils and Sleep – Are you Having Trouble Sleeping?